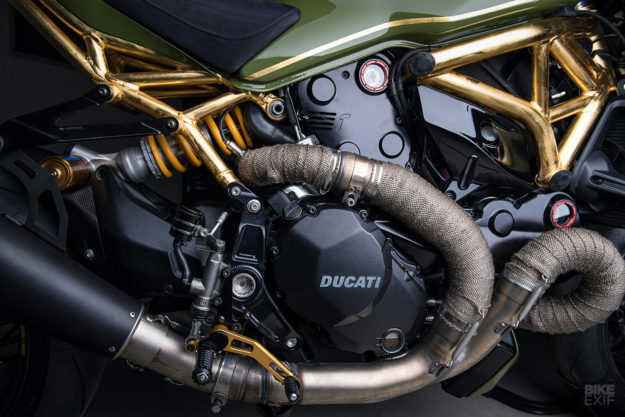 The Ducati Monster 1200 R is a brutal machine—and I mean that in the best way possible. With 152 hp and 125 Nm at the ready, backed up by Öhlins suspension and Brembo brakes, it’s a damn near perfect hooligan machine. Visually, it’s also surprisingly true to Miguel Galluzzi‘s original M900, even though the line is 25 years old this year. And just like the original Monster, it responds well to mild tweaking. 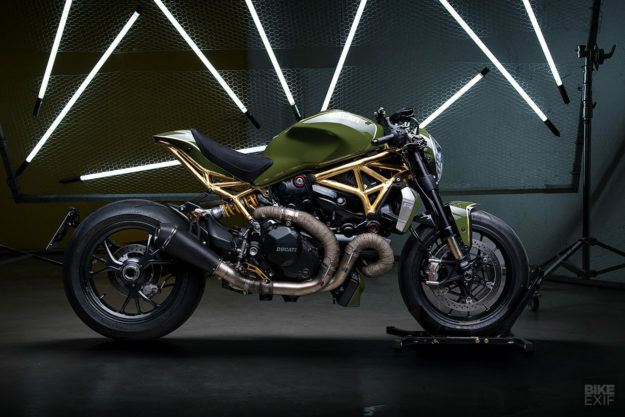 A little Rizoma here, a little Termignoni there, and hey presto, you’ve got a really special machine on your hands. 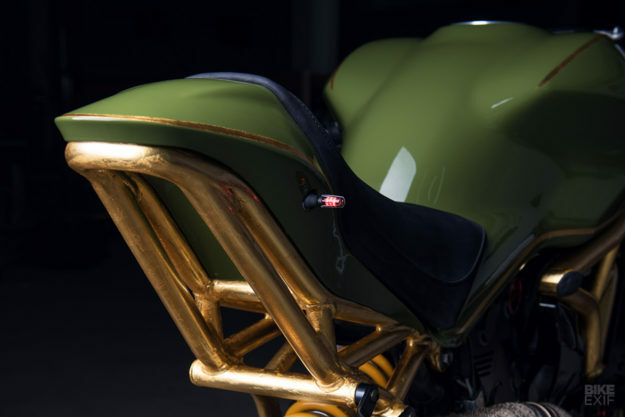 But what happens when you leave it in the hands of a young, motivated and innovative crew of custom builders? If the crew in question is Munich’s Diamond Atelier, good things happen. 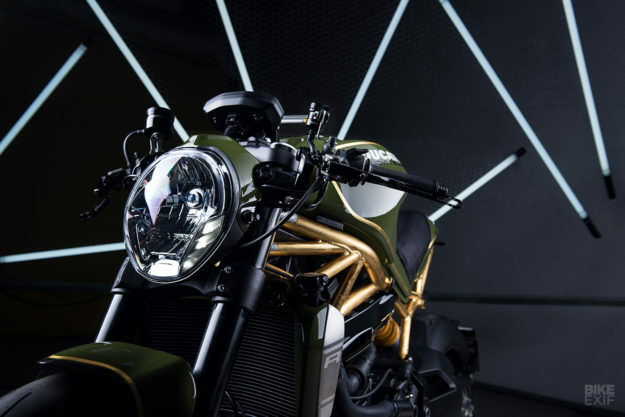 They’ve thrown a tasteful selection of trick bits at this 2017-model Monster, mixed in a few one-off touches that push it over the edge, and wrapped the frame in gold. A brave move. The commission came from an existing Diamond Atelier customer in Frankfurt. He’d given the guys free rein on a previous build, and was so chuffed that he was willing to do it again. There’s a lot on the 1200 R that looks exceptionally good out the box. 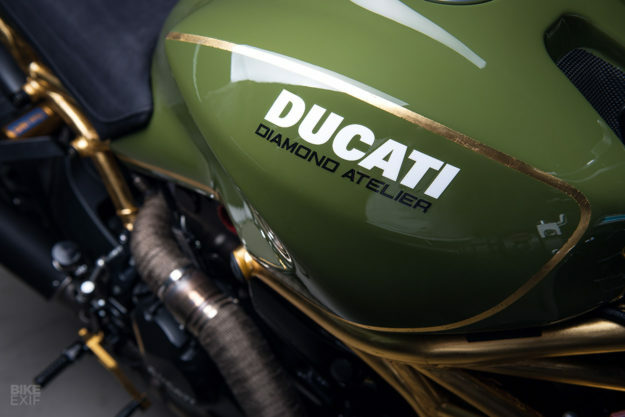 So Diamond kept the iconic Monster tank, and parts like the front fender and headlight. But the entire tail section went in the bin, pronto. 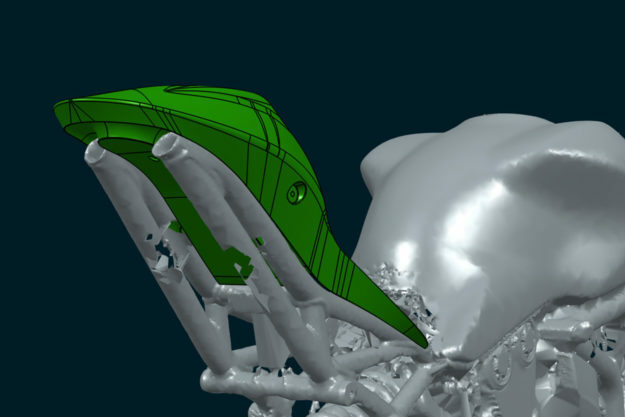 In its place is a custom-made tailpiece, designed using CAD software before being 3D printed. A hand-stitched cowhide leather seat sits on top of it, and the whole arrangement is perched on a custom-built subframe. Of course, reworking the rear end meant a whole lot of wiring components suddenly had nowhere to go, so Diamond had to relocate them. “But that was actually quite easy, compared to other bikes we’ve dealt with,” says Tom. 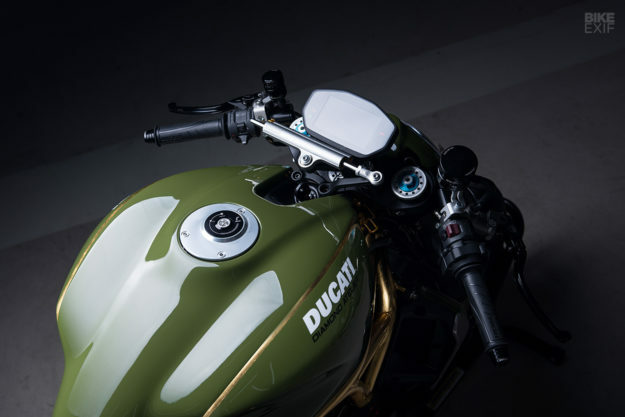 At the pointy end of the Ducati, Diamond have fitted a custom top triple clamp, along with a set of CNC’d clip-ons from Gilles Tooling. They’ve trimmed the headlight cover to accommodate them, and sunk in a set of Motogadget turn signals. Out back, a set of discreet LEDs doubles up as turn signals and taillights. They’re supplemented by Rizoma goodies, namely the CNC-machined clutch and brake reservoirs, rear license plate holder and engine covers. 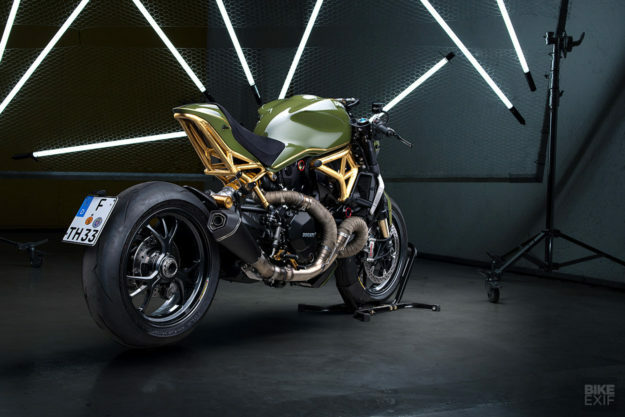 The rearsets are from Ducabike, the levers are Ducati Performance parts, and the exhaust can is a Remus slip-on. The rework has given the Monster an even more aggressive and compact stance than before. But it’s the paint scheme that really sets it off. Diamond have cleverly redone select bits in olive green, then added not only gold leaf striping—but also a layer of 24K gold to the frame. 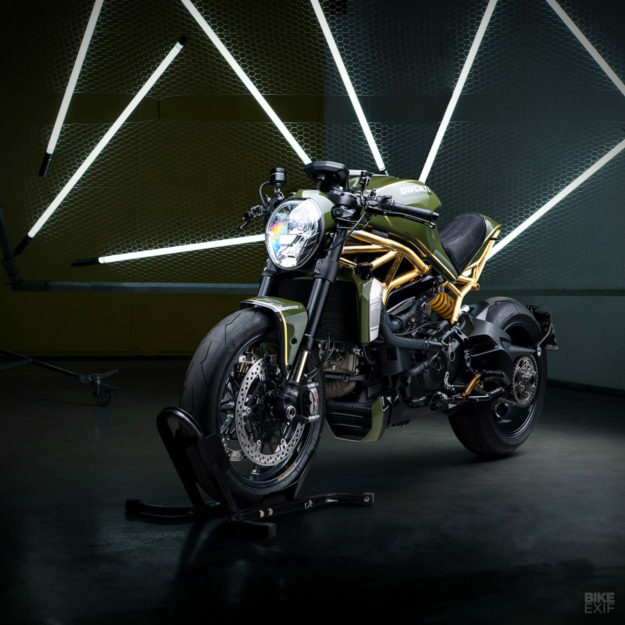 Tom mentions that the Monster 1200 R is pretty rare in Germany, which should make this gem even more rare. And the Diamond boys plan to keep it that way. When we heard the tailpiece was 3D printed, we automatically assumed they were planning a limited production run of Monsters (like they’ve done with their Mark 2 series). If we had a 1200 R in the Bike EXIF garage right now, it would already be in a crate and en route to Germany.